We understand that students, and their parents, want to know that what is brought to school is safe. To that end, we are committed to ensuring that each student is assigned their own locker that has been inspected and maintained by our custodial staff. Students may use their own locks or choose to purchase one from the school. After the first week of classes all unused lockers will be bolted shut by our custodial staff. Lockers are assigned to students in hallways by grade thus ensuring that students new to the school have a locker next to other students in their own grade. We keep a record of assigned lockers in the main office and a list of lock combinations. While we understand that students want to be close to their friends, we cannot re-assign lockers to accommodate these sorts of changes. We will, however, always accommodate students in special circumstances. Students, or their parents, are asked to contact administration for these requests. The principal and vice principal reserve the right to access any locker at any time should there be any concern over student safety. 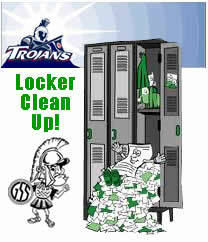 Once a semester we will assign a specific time for students to clean out their lockers to assist in keeping them clean. Remember: this is an old building and, like all older buildings, it has its share of 'univited guests.' The trick to keeping them out of YOUR locker is to NOT feed them! Please do NOT leave food in open containers in your locker. ALL locks and locker content must be removed at the end of the school year so that our custodial team can do a thorough cleaning. We are not responsible for items left behind. Thank you for being responsible in the HOME OF THE TROJANS!